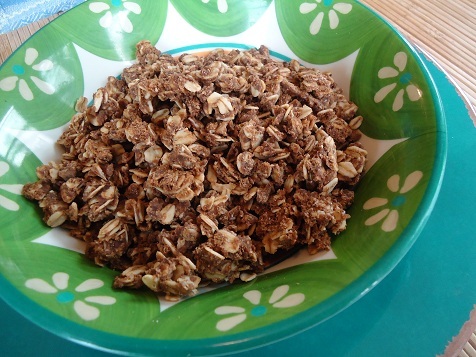 I’m calling this “granola” because that’s what it looks and feels like. But I do have a hard time calling this a healthy breakfast or snack. While it is made with real food ingredients, it is still more dessert-like, for sure. In an effort to make this a little less sugary, and a bit more diverse for “stir-in” options, I’ve tweaked the ingredients from the original cookie recipe Asa used. I’m pretty sure it will still taste awesome with less sugar than originally called for in the cookie recipe! Put butter, milk, peanut butter, sucanat, and cocoa into a medium sized saucepan. Cook over medium heat until butter is melted and mixture is smooth. Bring to a boil, stirring constantly. Allow the mixture to boil for one minute. Remove from heat. Add vanila, oats, and coconut flakes. If the mixture is too liquidy add a few more oats or coconut flakes until you reach desired consistency. UPDATE: If you do find your mixture too wet: Add a few extra oats to soak up the liquid. Then put it on a parchment paper lined cookie sheet and baked it at 250° for one hour, stirring occasionally. The granola should get nice and crispy! Chocolate no bake cookies are my favorite- but by no means the healthiest treat in the world! I look forward to trying this soon. I think we’ll really enjoy it. Thanks! Looks wonderful. I’ve been told not to use the “all natural” peanut butter for recipes where you need it to stick together. It ends up too runny and doesn’t hold up. So I’ve been forced to go and by the unhealthy highly sugared jar of pb on occasion for those recipes. Any one else heard the same thing? I only use natural peanut butter, even for granola bars and haven’t had a problem! Mmmmmm …. mixed in some homemade yogurt ~~ YUMMY!! Oh, I did that too! 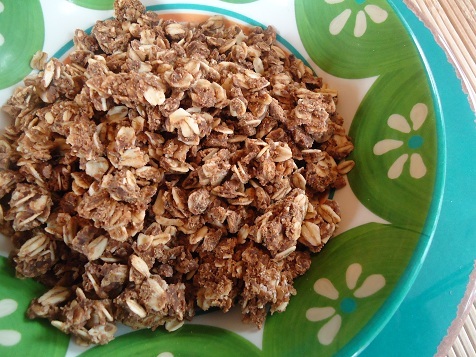 I was making no bake granola bars last night, and, well, it made good breakfast cereal. You could throw some raisins and perhaps nuts in there too. Yum! So then you let it dry and then use? Or bake it? Yep! If you let it dry but you don’t think it is dry enough, you can bake it for 30 minutes on a low temp. The recipe I use calls for 1 cup of peanut butter. I have not had them get to dry unless I cook them to hard. Mix sugar, cocoa, milk, butter in saucepan. Put on medium heat until mixture starts to a rolling boil. Boil one minute, remove from heat and cool one minute. Add rest of ingredients and stir well. drop about a teaspoon of mixture on wax or parchment paper. This is the recipe I have used for many, many years. I got this recipe from my culinary teacher in high school and there have been only a few times it didn’t set up right. I make no bakes with regular white sugar and when the mixture boils set a timer for a minute. I have subbed half sucanat, but with all sucanat they don’t turn out. Are the oats quick cooking?